Community management platform StreamElements has teamed up with data analysts StreamHatchet to provide a deep analysis of the streaming space. Ahead of TwitchCon 2018, the two companies have released 'State of the stream', a full report on the growth of streaming platforms, its creators, and their development throughout 2018. The report also documents the rise and fall of multiple titles across Twitch, and the growth of some sections of the platform, including the IRL category. Twitch is still the most popular streaming platform by a considerable margin, with 2.5 billion hours watched in Q3. That number is up 127 million hours from Q2 and 408 million hours since January. However, YouTube is slowly but surely closing in. The video platform now represents 25 per cent of all live streaming hours viewed, a 10 per cent increase since March. The report suggests that Twitch's flagship streamers don't have much room to grow. The top 100 channels amassed 262 million hours of watch time back in January, and that number had dropped to 254 million by September. That said, smaller creators are experiencing more growth across the board. Hours watched among the top 1000 channels (outside of the top 100) increased by 8.97 per cent. The next 4000 creators grew by 13.61 per cent and the 5001-10000 streamer bracket grew by 14 per cent. And as the platform's top creators stumble, so does its top game. 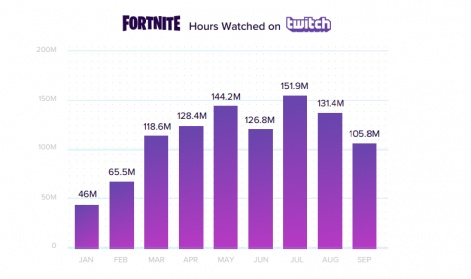 Fortnite continues to dominate the world but its presence on Twitch has begun to falter. The battle royale peaked in July with 151 million hours watched, but those views slipped by 20 and 25 million in August and September respectively. Q3 saw a few titles of old make their way back into the top games section. World of Warcraft's Battle for Azeroth expansion saw the MMO's view count expand by 232 per cent with an additional 87 million hours watched. CS:GO also had a successful Q3 with an additional 48 million hours watched, a 40 per cent increase in views from Q2. However, Q3 saw PUBG experience a 23 per cent drop in viewership, losing 25 million hours altogether. Blizzard's Overwatch also saw a 25 per cent drop in views with 18 million fewer hours watched on Twitch. Despite Overwatch's drop in views, Activision Blizzard is still the strongest games company on Twitch. Five of the top 20 games on the platform are made by the publisher; Overwatch, World of Warcraft, Heroes of the Storm, Heartstone, and Destiny 2. 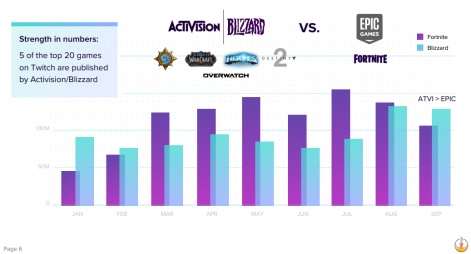 Combined views for all of Blizzard's titles saw the company overtake Epic for the first time since February. 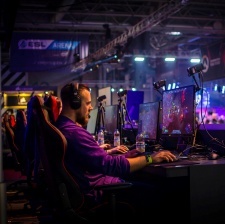 A lot of the bigger titles on Twitch also feature in esports tournaments, but only 9 -17 per cent of the overall viewership of Twitch is watching esports, with most months averaging 10 per cent. Twitch's IRL category still remains one of the most popular sections on the platform, with an additional 41 million more hours watched in Q3 than Q1. Back in January, IRL was the seventh most popular category. In Q2 it hopped up to fifth, and in Q3 it sits in third. However, Twitch ditched the IRL tag last month and replaced it with 10 alternative tags based around IRL topics. These include art, science, podcasts, and ASMR.